EURAXESS Brazil offered 2 sessions within the FAUBAI Conference 2018 agenda. 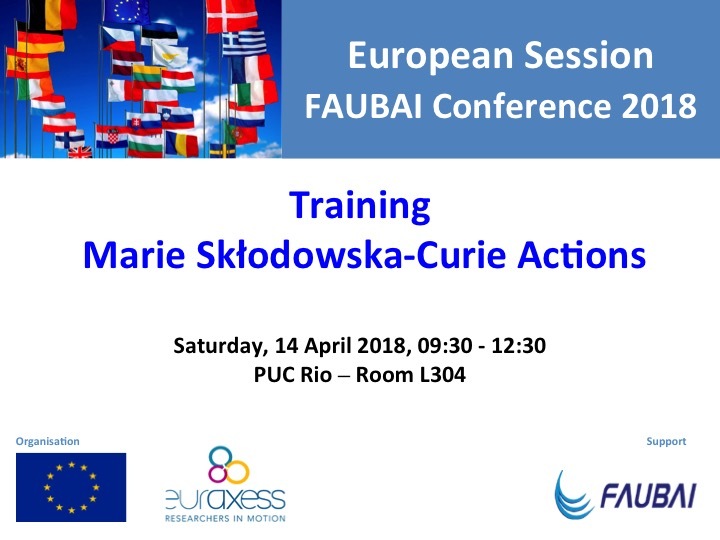 The first one is a training on Marie Sklodowska Curie Actions (MSCA) and how Brazilian higher education and research institutions officers can support their researchers interested in this European Commission funding and training programme (held Saturday 14 April, 9:30-12:30). The second session is coordinated by EURAXESS and gathered representatives of five European member states and associated countries. 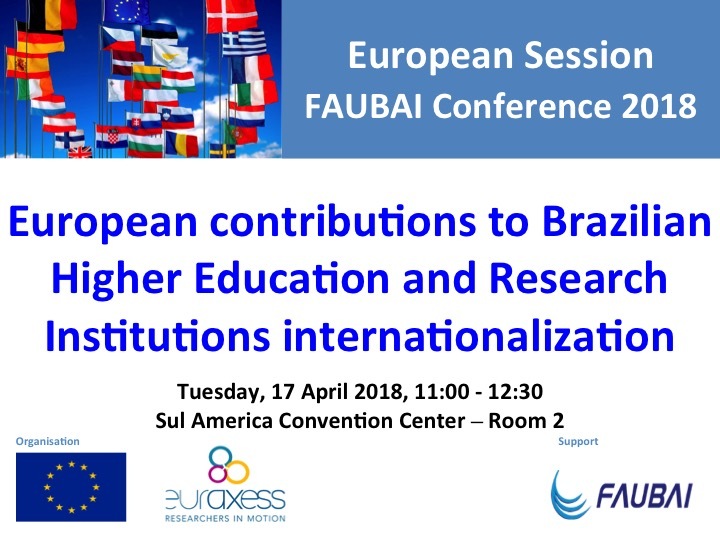 Entitled « European contributions to Brazilian Higher Education and research Institutions internationalisation », the session was held on Tuesday 17 April 2018, 11:00-12:30. Considering the launch of Capes’ call for the selection of Brazilian HEIs’ internationalization projects (PrInt), this European session aims at highlighting the contribution of the European Commission and its member states and associated countries to the internationalisation of Brazilian higher education institutions. Austria; Belgium; Denmark; Finland; France; Germany; Ireland; Italy; Netherlands; Norway; United Kingdom; Spain; Sweden; Switzerland. EU – EURAXESS/ Charlotte Grawitz, EURAXESS Brazil Representative. The events were open to FAUBAI Conference registered participants only.